Yea. I was perplexed because in addition to your stated core belief, you have posted in other threads like One New York Place, which has little to offer other than views, and have been an advocate of height too. So, sorry to be repetitive, but is this the NAT? I just saw on channel WNBC about a tower that is going to be built on this site!!! They didnt say much about who is building it or the architect but I saw a glassy rendering of an interesting design. Anyone else saw the news? No, but you must now devote your life to finding that rendering. Journey, boy. Is this the same International Broadcast Center that appears in the 2012 Olympic plans? Did the building look like this? Of course its at the wrong location, right street, it will be a block in front of the squat brown Daily News Building. Last edited by NoyokA; May 14th, 2005 at 08:41 PM. 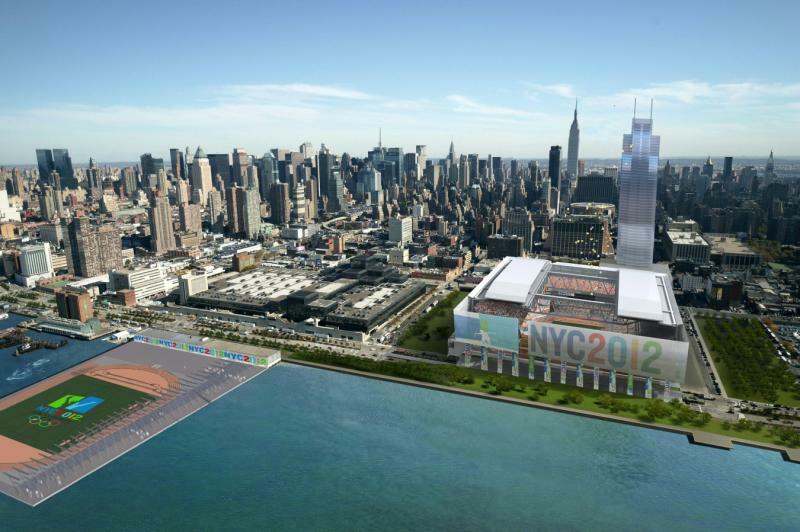 If it is the same Olypmic related Broadcast building then I would assume Brookfield is waiting on seeing if the stadium will indeed be built and then if the Olympics will be coming to NYC as they would then be better able to gauge what kind of an office demand will come to the area. Stern! Yes it is! Oh my fault I guess, I never saw this picture before. So I guess there are going to be 2 towers on 31 street... I hope. Anyway... the story was that the city have said that the tower will be built as part of the development and so the MTA havent considered this tower as part of the development on the yards. That is all the news I heard when I flip to the channel. That is a greate building. And back to what Stern and Kliq have been saying, Height is always the plus, it also comes to symbolize a city too, not only the corporate wealth, but look at the iconsthat the twin towers were for us, and when they were that big, they symbolized America and American capitalism, thats why it was targeted. Brookfield Financial Properties bought a development parcel on Ninth Avenue last week for well over $100 million in the latest sign, developers say, that the market is finally ripe for building new office towers in Midtown. For two decades, Brookfield has owned an adjacent site, across Ninth Avenue from the Farley Post Office building, between 31st and 33rd Streets, but was unable to lure a corporate tenant that far west during real estate booms in the 1980s and the late 1990s. Now, with rents soaring and few large blocks of space available in Midtown, Brookfield, one of the largest commercial landlords in the city, decided that the time was right to acquire the adjacent parcel from Harvey Schulweis to build two, or possibly three, office towers. Combined, the properties cover five acres, about the size of Bryant Park. Under the current zoning, the company could build up to 4.6 million square feet of space, the equivalent of two Empire State Buildings. In addition, SJP Properties, Vornado Realty Trust and Boston Properties are considering new commercial towers on the West Side after a six-year lull in office development. According to Cushman & Wakefield, the vacancy rate for prime Midtown office space has fallen to its lowest point since 2000, 4.8 percent, while the average annual rent has climbed to more than $60 per square foot. And two buildings that are already under construction, including the headquarters for The New York Times, have leased nearly all their space at rents that were unthinkable two years ago. The developer Douglas Durst and the Bank of America are building a 54-story, 2.1 million-square-foot tower at 42nd Street and Avenue of the Americas, where a law firm recently signed a deal for $100 per square foot. So far this year, 31 companies have signed deals with rents of $100 or more per square foot, which is about what a developer needs today to justify building a new tower. So unlike Mr. Durst, who started his project with an anchor tenant, SJP Properties plans to break ground soon on a 40-story, 1.1 million-square-foot office tower at the southeast corner of 42nd Street and Eighth Avenue without a tenant. “This is the first time in 25 years that we’ve seen the Midtown market this strong for Class A office space,” Steven J. Pozycki, SJP’s chairman, said when the company bought the land in August for $305 million. Across Eighth Avenue from SJP’s site, Vornado Realty Trust and Lawrence Ruben Company recently revived talks with the Port Authority of New York and New Jersey to build a 1.3 million-square-foot office tower over the north wing of the bus terminal. The developers agreed in 1999 to pay the Port Authority more than $110 million for the development rights, and there were talks about building a headquarters for Cisco Systems. But the dot-com boom collapsed in 2000, along with the chances of landing a tenant. Since then, the two sides have been in litigation, though they now seem eager to get the project moving again. Vornado also owns another potential development site, the Pennsylvania Hotel, across Seventh Avenue from Madison Square Garden. Related Companies and Boston Properties are putting together a commercial development site on the east side of Eighth Avenue at 45th Street, according to real estate executives, that would involve using air rights from nearby Broadway theaters. But it can take years to obtain government approvals and erect a tower. The New York market can be fast-moving and treacherous. In 2000, when the Midtown vacancy rate was 2.2 percent, the developer Jules Demchick planned a 17-story office building for the north side of 42nd Street near 12th Avenue. But New York soon plunged into a recession, and the vacancy rate jumped, although housing prices continued to rise. Mr. Demchick, a shrewd builder, switched back to his original plan, a 49-story apartment tower, which is now nearing completion, by a different developer. November 2, 2006 -- Brookfield Properties, the real estate giant that owns the World Financial Center, plans a huge new office development across the street from the proposed Moynihan Station project, The Post has learned. To do it, Brookfield plans to build a platform over an exposed Amtrak/New Jersey Transit rail yard between Ninth and Tenth avenues, even while the state and city dither over similar proposals for portions of the same yard farther west. Brookfield is not waiting to see what happens with the Moynihan project. "They are actively marketing their site now, talking to major space users," a source said. Last week, publicly traded Brookfield quietly completed an assemblage that gives it control of the entire West blockfront of Ninth Avenue between 31st and 33rd streets. Brookfield has owned the portion above the rail yard since the mid-'90s. But it long coveted the blockfront's crucial northern corner, now a parking lot owned by Harvey Schulweiss. A few days ago, Brookfield finally bought the lot at 400 W. 33rd St. for an unknown price. Calls to the company were not returned. Brookfield's parcel is across the avenue from the Farley Post Office, where the Moynihan station and/or a new Madison Square Garden might one day rise. A source said Brookfield "has a year of planning and negotiations ahead" before it can build. But unlike at the rail yard between 11th and 12th avenues, where the Jets wanted to build a new sta dium and would have had to buy air rights from the MTA, most devel opment pro tocols at the Ninth Ave nue yard are in place. Brookfield owns the air above the tracks. It has agreements with Amtrak regarding construction dating back to when the site was owned by Olympia & York, which built the WFC and whose U.S. assets Brookfield acquired in 1996. Brookfield's assemblage takes up nearly two-thirds of the superblock between Ninth and Tenth avenues, where there is no 32nd Street. It can support 4.7 million rentable square feet under new zoning. To build that much, Brookfield would have to buy air rights from nearby properties and provide certain public amenities. With Midtown vacancies below 6 percent and demand strong, Brookfield is eager to get started. "They will not build on spec, but are considering a two-building or a three-building option depending on tenant interest," a source said. With its recent purchase of competitor Trizec, Brookfield owns about 18 million square feet of office space in Manhattan. Copyright 2006 NYP Holdings, Inc. All rights reserved. New DEMO Permit for that site was issued on 10.31.06. Skyline Hotel 10th Avenue - How is the area?